Today we release the English translation of Carsten Hensel’s book: Vladimir Kramnik: The Inside Story of a Chess Genius. This is really a remarkable book, which has already gained attention in German for its descriptions of the tumultuous years 2005-2006 in the Chess World. But of course it covers much more. 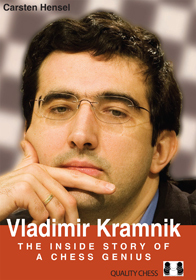 The book is not objective, it takes sides, but what else would you expect of Kramnik’s former manager? Of other points, we should say that Kramnik contributed greatly to the book by talking about key games and about all the other World Champions in detail. Although this is a translation, we approached the book like we would any other project and did a thorough fact check and assisted the author in bringing his vision to the readers in the strongest possible way. Now it is the marketing stage of course, which includes sending out review copies and getting people to talk about the book. A part of this has been to organise an interview with Carsten by Ben Johnson of the Perpetual Chess Podcast. It is Podcast no. 100 no less! The Interview is available here. The always excellent New in Chess magazine arrived in our office yesterday, with another batch of reviews by GM Matthew Sadler. Three of them were about Quality Chess books. The Appendix is just an add-on! Those who have read Thinking Inside the Box may have noticed that there are a few pages in the end where I make the case for following a plant based diet. This is sometimes known as a vegan diet, but there is a substantial difference, as veganism is about ending animal cruelty, which I am all for, but which is not why I prefer a plant based diet. Having debated CRITICAL MOMENTS here on the blog with a number of readers, I received a longer email from our friend and one-time author, Amatzia Avni. I’m following your blog and although I haven’t yet read your “Thinking inside the box”, I strongly disagree with some observations you make regarding the nature of “critical position” (or critical moment). “A position where the difference between the best move and the second-best move is high, let’s say half a point”. 9/5/2017. Last week I put up a post referring to a positive review of Victor Mikhalevski’s Beating Minor Openings from GM Matthew Sadler in New In Chess magazine. In this follow-up post, we can proudly reveal that King’s Indian Warfare, by Ilya Smirin, received even higher praise, with Sadler going so far as to call it his ‘Book of the Year’ for 2016! Obviously we are delighted that the book has received such high praise; and we hope readers will find it the perfect companion to Kotronias’s epic King’s Indian repertoire series (the last of which I’m currently editing), with one author providing the creative inspiration and the other the theoretical recommendations. We were pleased to see a couple of positive reviews from the formidable English GM in New In Chess magazine. b) he would prefer if chess authors (not just Mikhalevski) would make it clearer which of their recommended lines are the product of engine analysis. The second of these is an interesting observation on what is something of a grey area, as every line in a good opening book will have been computer-checked to some degree. Still, it’s something we will consider for future books. In any case, we were happy to see the generally positive review along with Sadler’s conclusion that “It’s an excellent book”!